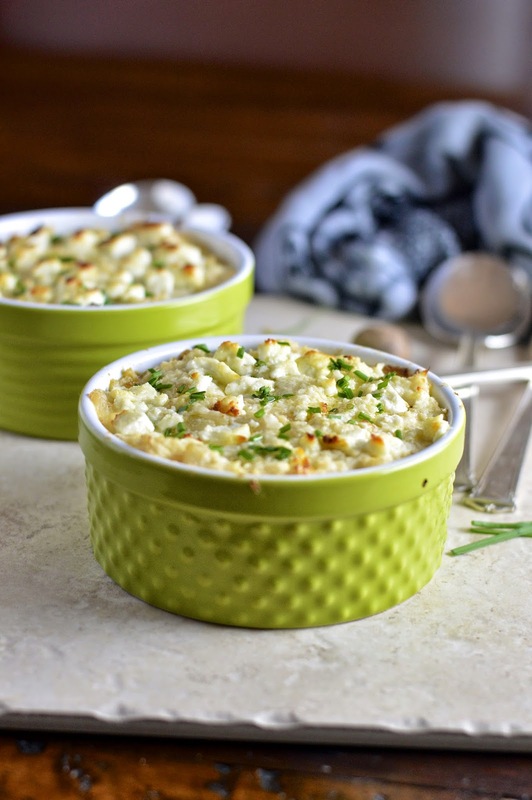 This week, for my regular contribution to FN Dish, myself and other bloggers listed below were asked to make a mashed side dish utilizing fresh produce. Well I made something “smashed” so I hope that counts! 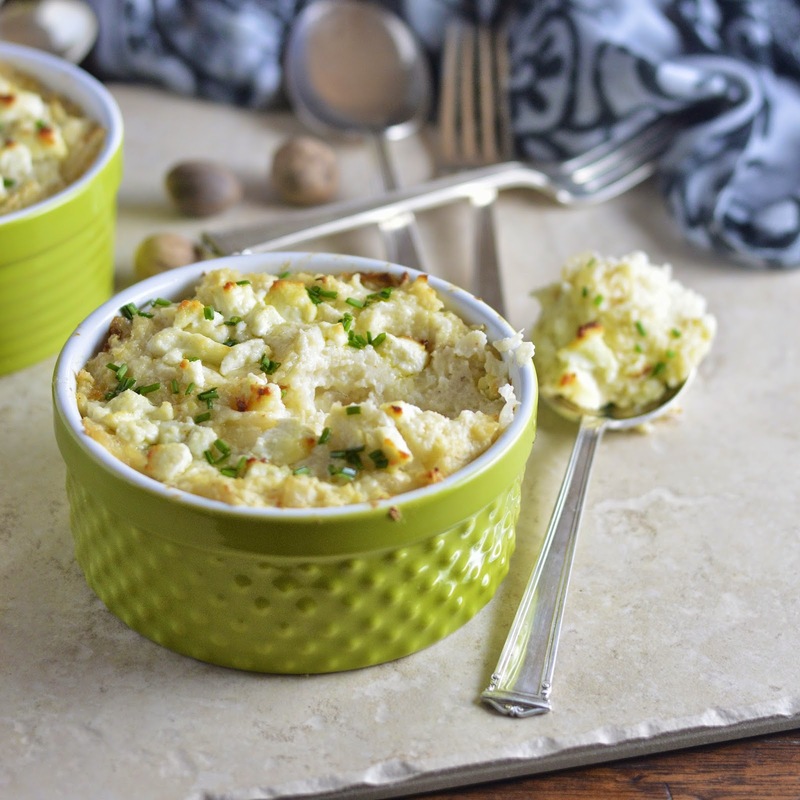 This Smashed Cauliflower Gratin with Goat Cheese is gluten free and grain free, therefore Paleo. Yet this dish isn't missing anything. It's satisfying (if not more) like a heaping pile of mashed potatoes. OK, is it my imagination or is cauliflower kind of the “it” ingredient now? I see it as the main component in pizza crusts, pasta sauces and perfectly roasted on it’s own. I’ve always liked cauliflower, but I’ve grown to truly love it with all these creative preparations. I added some pretty delectable ingredients to this smashed yumminess. Aside from the cauliflower, I tossed in some butter, onions, garlic, and goat cheese. I baked that beautiful concoction up, until bubbly and browned, and topped it with some freshly snipped garlic chives from my herb garden. The goat cheese is a flexible ingredient, but it is truly one of my favorite cheeses (mildly obsessed). You could sub in some white cheddar or Swiss to create a slight variation. Anyway you prepare it, I think you’ll find this Smashed Cauliflower extremely easy to make and a quick family favorite. In a large pot bring salted water to a boil. Add cauliflower and cook for 15 minutes or until very tender. Set aside. In a medium saucepan, melt butter on medium heat. Add onions and cook for 5 minutes until the onions are translucent. Add garlic and cook for 2 more minutes. Stir in nutmeg, cayenne and salt. 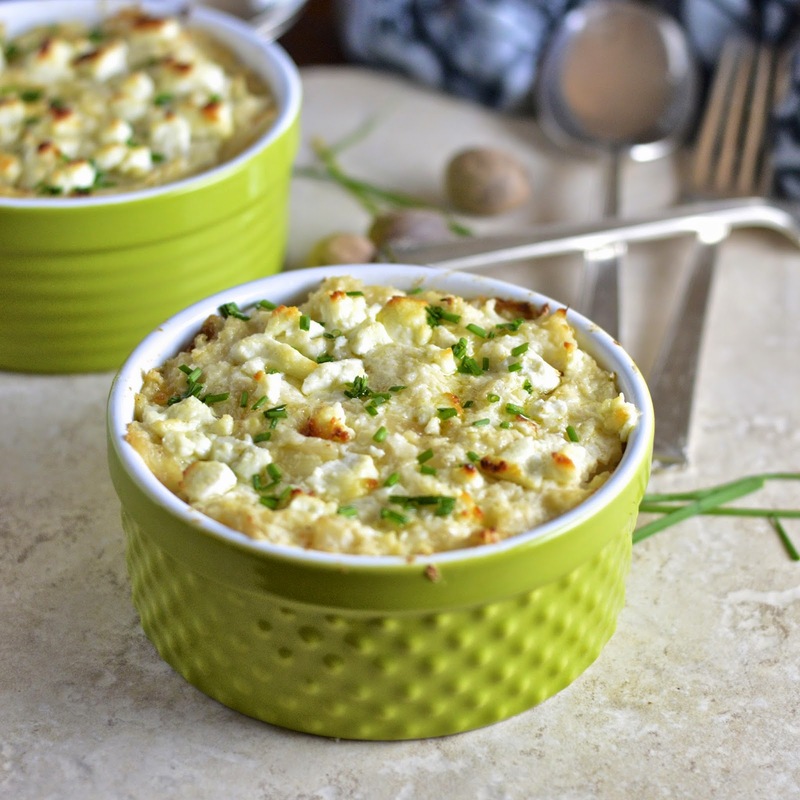 In the bowl of a food processor combine cauliflower, cream cheese, and 2 ounces of goat cheese. Blend until just combined, leaving some whole pieces of cauliflower for texture. 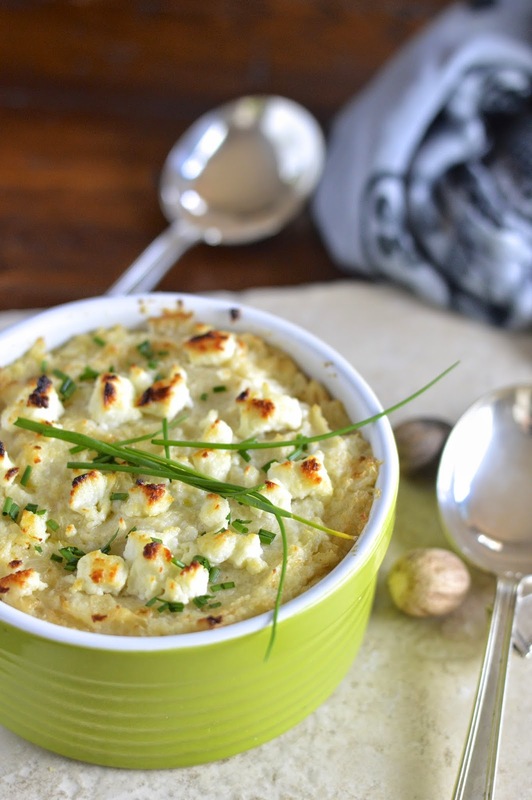 In a large bowl combine cauliflower and onion mixture. Adjust salt to taste. Put mixture into a buttered 2 quart casserole dish or individual ramekins. Crumble the extra 2 ounces of goat cheese on top. Bake for 15 minutes until lightly browned on top and heated through. Garnish with chives and serve hot.